American engineer; born in Bohemia Oct. 31, 1848. When very young he removed with his family to the United States, settling in Cleveland, where he was educated at the public schools. In 1864 he joined the engineer corps of the Union Pacific Railway; in 1868 he settled in Omaha, where he was for the following two years assistant city engineer, being appointed city engineer in 1870. 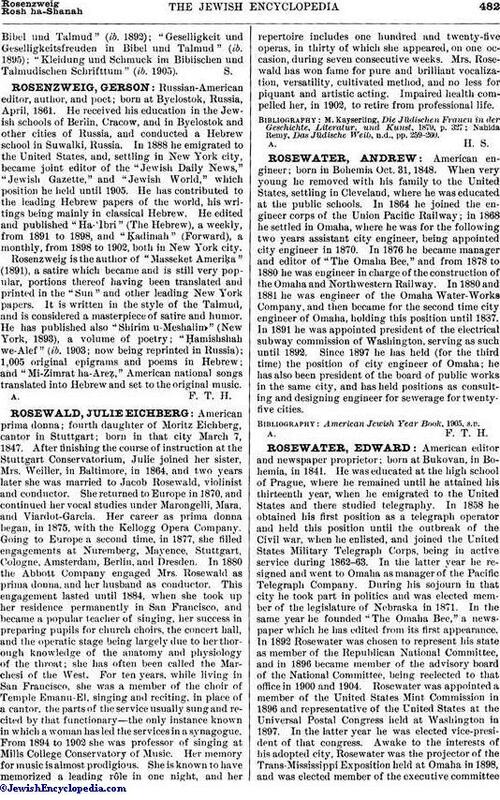 In 1876 he became manager and editor of "The Omaha Bee," and from 1878 to 1880 he was engineer in charge of the construction of the Omaha and Northwestern Railway. In 1880 and 1881 he was engineer of the Omaha Water-Works Company, and then became for the second time city engineer of Omaha, holding this position until 1837. In 1891 he was appointed president of the electrical subway commission of Washington, serving as such until 1892. Since 1897 he has held (for the third time) the position of city engineer of Omaha; he has also been president of the board of public works in the same city, and has held positions as consulting and designing engineer for sewerage for twenty-five cities. American Jewish Year-Book, 1905, s.v.